A large, fuzzy or hairy bee with a black and yellow (sometimes orange), usually banded, coloration. Bumble bees always have some fuzz on the abdomen. Females have pollen baskets on the last pair of legs. Entomologists and decidated amateurs use details of wing venation and other structural fine points to identify the many different species of bees. Similar species: Carpenter bees, which carve nest holes in dead wood, are similar in size, shape, and color, but they have shiny, hairless black abdomens, while bumblebees have fuzz on their yellow-and-black-banded abdomens. There are many species of bees that you have probably never heard of; also, there are many flies and beetles that have yellow-and-black patterns that mimic the warning colors of bees and wasps. Hummingbird moths and other sphinx moths also mimic bumble bees. Length: about ½ to 1 inch. Bumble bees sometimes build nests in brush piles, trash heaps, bird houses, and other protected places. These wax cells were taken from a former bumble bee nest in late winter. The nest had been in an old bird house. Bumble bees collect pieces of moss, bits of animal hair, grasses, and other soft materials to insulate and protect their nest. In the day, they are commonly seen foraging among flowers for nectar and pollen. Bumble bees often sleep at night by clinging to the underside of a leaf. The buzzing sound bumble bees make is caused by vibrations of the wing muscles inside the insect's body, and not by the wings themselves. A common myth maintains that bumble bee flight defies the "laws of physics." That notion was based on the idea that insects flap their wings up and down; instead, they sweep them back and forth, changing the angles, something like helicopter or hummingbird flight. Adults eat nectar, and pollen and honey are fed to the young. Honey and pollen may be stored in vacant nest cells. Edwin Way Teale described the specialized structure (the corbicula) on the hind legs of bumblebees and honeybees as "baskets for carrying pollen home from the fields." Despite their many similarities to honeybees, bumblebees don't overwinter as a hive and thus don't stockpile much honey. 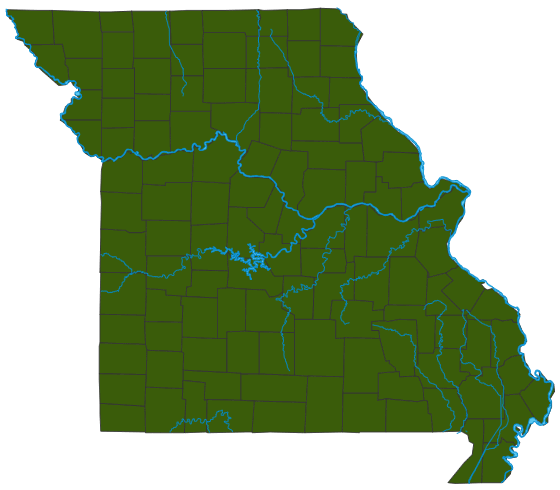 At least six species of bumblebees occur in Missouri. Nests rarely have more than a hundred workers at a time, and unlike honeybees, bumblebee hives don't usually survive the winter. Although they are social insects and are capable of stinging, they do not aggressively defend their colonies like some species of wasps or Africanized honey bees. Many bumble bee species are declining, and in Great Britain people are making special efforts for their conservation. Look online for instructions for building bumble bee nest boxes. Bumblebees usually nest in cavities below ground (frequently rodent burrows), but nests may also be in brush piles, trash heaps, bird houses, and so on. They are rarely in direct sun. In spring, a single fertilized female (queen) finds a suitable nest site and builds in it a large, irregular cell of wax and pollen and stocks it with pollen and nectar. Several eggs are laid in the cell; the queen then enlarges the nest and supplies the grublike young with additional food. She speeds the development of her eggs and young by incubating them. They will become workers and take over the pollen and nectar collecting, feeding additional young, and other nest duties. Later in the season, the queen lays eggs for queens and males (drones); in fall, these leave the colony to find mates. In our area, the whole colony dies during the winter. Only young queens survive the winter by hibernating in the ground. The next spring, these fertilized queens begin a new colony. Bumble bees are important pollinators, which is significant for humans agriculturally, horticulturally, and environmentally. Some plants can only be pollinated by bumble bees. Red clover, an important fodder and traditional medicinal plant, is rarely pollinated by other bees. Bumble bees are capable of stinging, if molested or if their nest is endangered, but you need not fear them; they are not aggressive. Considering that many bumble bees are declining, if you find a bumble bee nest on your property, leave them alone and consider yourself lucky. Watch them over the course of the season; take pictures! Bumble bees, like many other pollinators, have certain plants that depend only on them for pollination. Bumble bees have many other interrelationships with organisms that most of us are scarcely aware of, which all have their own role in the chain of life.